Whether it is a home or workplace, it takes a lot of work to keep your surroundings clean. Some bits are easier to keep clean than others but a proper window clean is always a chore! Tackling those transparent surfaces is not as easy as it seems. Without the right tools and technique, your Prince Albert window cleaning can be an issue. 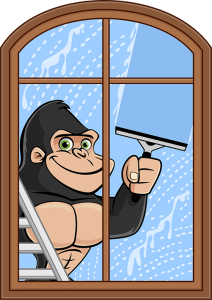 Lucky for you, all it takes is one phone call to our Gorillas to have your windows looking great. Using environmentally friendly cleaning solutions are gentle on window surfaces without losing any of the cleaning power that you might expect from our Gorillas. Solutions are a vital part to the overall cleanliness of your windows but they are not the only piece. By foregoing the classic rag or paper towel techniques, our Gorillas have opened the door to brave new possibilities. In this case, these techniques involve rubber squeegees for the most accessible windows and water-fed poles for those hard to reach places. With these tools at our disposal, Gorillas are able to clear out every corner and seam of your windows. Why settle for anything less than a complete clean for your home or business property?